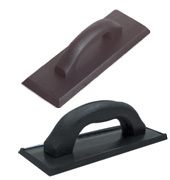 Rubbing stone - Dresses diamond blades or can be used to smooth rough edges on freshly cut tile. Water heater - For use in extreme conditions when the need arrises to warm saw water. The Right-Square - Universal tool for any construction layout application, creates 45 and 90 degree angles. Tile Markers - Easily mark on any slick surface - tile, glass or stone. Marks will remain on tile when cutting with a wet saw; then easily wipe clean. 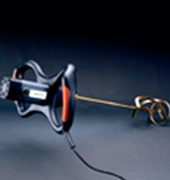 The Brutus undercut saw can be used to undercut doorjambs and other obstacles. It features a trapezoid shaped high carbon steele blade, 10 point saw teeth on both sides, and a soft grip handle. SP-15143P Gum rubber grout floats - 4"x9"
SP-15144P Gum rubber grout floats - 4"x12"
SP-15145P Gum rubber off-set grout floats - 12"
Srub float - Designed to clean epoxy grout residue from tile and great for cleaning porcelain and tile in pools, showers, baths, etc. Blue pads are coarse for maximum scrubbing power, white pads are less coarse and work great for epoxy applications. Grout gloves - For tile setting and other industrial or household applications. Rolled cuff, extra long gauntlet , and flocked liner to keep hands dry. Resistant to most caustic chemicals, paints and sealers. Cheesecloth - Polish any tile surface to a bright finish, made of unbleached cotton. SP-15153P Grout floats - Probilt Series - 3-1/2"x9 1/2"
SP-15125P Grout floats - Probilt Series - 2"x5 1/2"
SP-15144G Grout floats - Probilt Series - 4"x10 1/2"
Polyproxylene™ Grout Floats with SoftGrip™ Handles. Grout bag - Ideal for grouting tile or masonry. 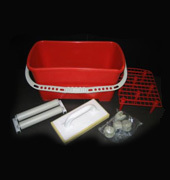 The original white grout bag with built-in, molded Duralon tip for smooth flow of grout, reusable many times over. Grout rout - For removal of grout or excess thin-set before grouting. For joints from 1/8" to 1/2". Comes with Softgrip handle. Carbide saw - Removes old grout, stackable, replaceable carbide-coated blades. Comfort-grip molded PVC SoftGrip handle. Grout sealer roller bottle - Easily applies sealer or colourant to grout. Foam wheels in two sizes for different size grout joints. Grout sealer applicator - Easily applies sealer or colourant to grout. Brush makes applying neat and easy. QEP-7005 Super Sponge XL 7.5x5.5x2"
Tile grout sponges - For grouting and cleaning, featuring a smooth, less porous surface that will not load with sand, cement, or grout. Exceptional absorption, easy to rinse and long-lasting. SuperiorBilt Microfiber Sponges are especially useful to absorb liquid without leaving residue on tile surfaces. Ideal for grout and sealer applications. Medium 5 1/2" x 11"
Unlike ordinary grout floats, our solid Polyproxylene™ float is built to last, it doesn’t have layers of material to peel apart. The combination of a soft material and a sharp edge leaves less grout behind, making clean-up faster and easier. Instead of a traditional D-shaped handle, our specially designed handle gives comfort in either hand and it’s long enough to fit both hands. 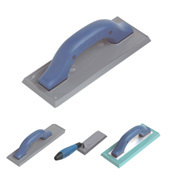 Offset handle means no reason for a second float to grout hard-to-reach areas. Unlike ordinary heavy-duty drills, this mixer is designed for low speed (0-700 rpm) mixing of mortar, grout and self-leveling products to reduce the amount of air blended into the mix. Ergonomic handle makes it a balanced grip — easy to control and hold steady. Powerful 1100w motor has thermal overload protection, preventing it from overheating and cutting out under heavy load. Complete with two paddles specifically designed for mixing thin-sets and grout — also includes a custom tool bag. Unlike ordinary knee pads, ours are designed for comfort, offering a custom fit with designated left and right to match your knee caps. Your shin is supported with a lower wedge that takes pressure off both your knees and toes allowing extended working time with minimal discomfort. 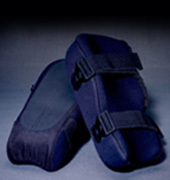 Made of dense foam, these knee pads offer the ultimate in comfort and durability. Extra wide straps won’t bind behind your legs. Wax bowl ring - Anti-leak, no seep gasket. Comes with plastic flange and 3-1/2" x 1/4" brass bolts. Fiberglass board tape - Alkalai resitant mesh construction. For covering holes, cracks and joints in backerboards. Right-angle straight edge for bathtubs, shower stalls and floors, lightweight aluminum construction. Scraper - Die-cast aluminum head construction with sharpened steel blades. The head is welded to the handle (not crimped) making the scraper extremely durable. Set contains: 18", 24", 30", 36", 54", 72" accurate straight edges and wrap around handle. 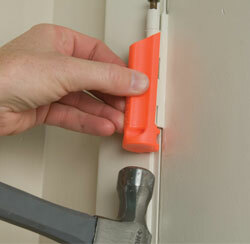 Roberts Door Hinge Pin Remover is made of a high impact plastic which protects doors and moldings. Nickle plated, hardened steel pin drives hinge pin out of hinge plate. 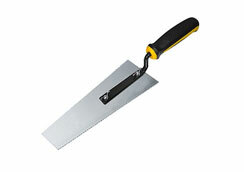 Probilt Series trowels come with stainless steel blade for rust free durability and comfortable Softgrip handles. SP-8551G Probilt Trowels - Square Notch 1/4"x3/8"x1/4"
SP-8588G Probilt Trowels - Square Notch 1/4"x1/4"x1/4"
SP-8599G Probilt Trowels - Square Notch 1/2"x1/2"x1/2"
Probilt margin trowels - Forged high carbon spring steel with Softgrip handle. For patch jobs, hard-to-reach areas, and spreading thin-set on V-cap bullnose tile. Both trowels are 2"x6" in size with wooden handles. 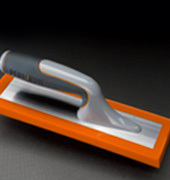 Schluter Trowels, specifically designed to install Ditra & Kerdi products. Cross-Blade - use with thin-set or medium-bed mortars, designed to mix flat on the bottom with figure-eight motion pulling material into suspension. Cheater Beater - use with thin-set or medium-bed mortars, injects little or no air on a dry or wet mix. Hardwood beating block - For easy tapping on tile surfaces, tapered corners and edges for hard-to-reach areas. 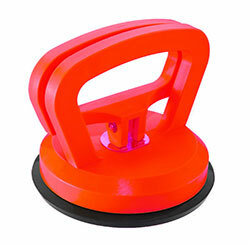 Suction cup - For easy handling of non-porous tile, marble and glass during installation. Suction cup pad is 4-1/2" in diameter and holds up to 12 lbs. 3-1/2" wide handle opening easily accommodates large hands. Tile spacer puller - For use as a spacer remover, with non-scuff rubber bumper which acts as a fulcrum and protects edges of tile. Complete with Softgrip handle. QEP-10067 Bulls-Eye Spacers - 100/Pkg 1/6" & 3/16"
QEP-10068 Bulls-Eye Spacers - 100/Pkg - 1/8" & 1/4"
The patented LASH (LEVEL ALIGN SPACE HOLD) system is designed for quick installation and reduces costly call backs by insuring that the finished floor surface is lippage-free. This time saving system helps adjust the height of the tiles and evenly holds their edges throughout the curing process of the setting material. PP-PRSC1 Prolevel CROSS SPACER - 1/16"
PP-PRSC2 Prolevel CROSS SPACER - 3/32"
PP-PRSC3 Prolevel CROSS SPACER - 1/8"
PP-PRSC5 Prolevel CROSS SPACER - 3/16"
PP-PRSL1 Prolevel LINEAR SPACER - 1/16"
PP-PRSL2 Prolevel LINEAR SPACER - 3/32"
PP-PRSL3 Prolevel LINEAR SPACER - 1/8"
PP-PRSL5 Prolevel LINEAR SPACER - 3/16"
PP-PRST1 Prolevel T SPACER - 1/16"
PP-PRST2 Prolevel T SPACER - 3/32"
PP-PRST3 Prolevel T SPACER - 1/8"
PP-PRST5 Prolevel T SPACER - 3/16"
PP-RC1 Progress Perforated CROSS SPACER - 1/16"
PP-RC10 Progress Perforated CROSS SPACER - 3/8"
PP-RC2 Progress Perforated CROSS SPACER - 3/32"
PP-RC3 Progress Perforated CROSS SPACER - 1/8"
PP-RC4 Progress Perforated CROSS SPACER - 5/32"
PP-RC5 Progress Perforated CROSS SPACER - 3/16"
PP-RC7 Progress Perforated CROSS SPACER - 9/32"
PP-RT1 Progress Perforated T SPACER - 1/16"
PP-RT10 Progress Perforated T SPACER - 3/8"
PP-RT2 Progress Perforated T SPACER - 3/32"
PP-RT3 Progress Perforated T SPACER - 1/8"
PP-RT4 Progress Perforated T SPACER - 5/32"
PP-RT5 Progress Perforated T SPACER - 3/16"
PP-RT7 Progress Perforated T SPACER - 9/32"
Probilt kneepads are made from high density foam inner pad and a non-skid outer shell for maximum grip. The unique accordion design affords maximum comfort and protection. Improved rubber straps adjust quickly for a perfect fit. The Superiorbilt underlayment roller ensures proper adhesion by removing air pockets and smoothing out the surface. Handle is adjustable from 18"-32" in length and has non-marking rollers.